For as long as I can remember, I have found myself in love with Sports films. Some people may call them cheezy or ‘too slow’, but for me, they always possess an amazing story. In addition to that fact, there are so many subliminal messages that go into a great sports movie. For starters, they remind us that although there are times in life when it may seem like it – we are never alone. In about 94% of these films, there is an emphasis on the fact that no player succeeds unless the entire team does. If you aim to go out there on the field and play like a one man superstar, more than likely you will not have the support of your team – leading to a disruption in that camaraderie. They also show that a true teammate will be there for you, especially when you fail. I love seeing how the films main character will develop relationships with their coaches and teammates, especially when the times get tough. Another life lesson to be learned is that hard work pays off, and it motivates an intrinsic desire. There is something that warms my heart about watches the players come together as individuals to achieve a greater goal that none can reach alone. I absolutely love that. In about 80% of the sports movies, it either takes a big game loss or a tragic death to be the game changer and make the players realize how much they truly need each other. The part I confess to love the most about all of these sports movies, is the big ‘game day’ speech that the Coach will give to his players before they storm the field. I’ve been on both sides of the speech, as both a player and as a little league softball coach, and I can honestly say it is my favorite part of the game. As a coach, I loved seeing my players get super excited to run out and take the field. As a player, I loved hearing my coaches of the past emphasize how much they believed in me and my teammates. Denzel Washington delivers an extremely powerful speech in this particular scene as a parallel to unite his team members all together, stating that if the team did not find a way to put their differences aside – before it destroyed them. This speech is so empowering that the United States Army actually started incorporating it into their Master Resiliency Training classes. This speech will always sit extremely close to my heart, and I believe that this speech in particular needs to be heard in today’s day and age once again. This speech isn’t number one based on the length or the timing of it, but more so because of the incredible message behind it. 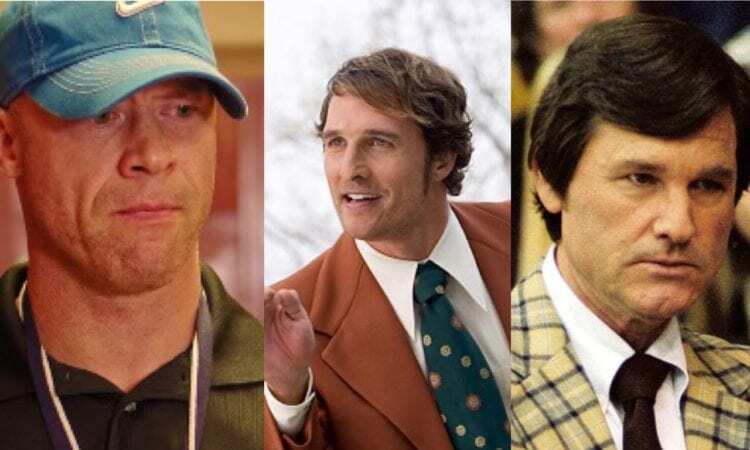 Matthew McConaughey portrays CoachJack Lengyel in a true story of tragedy, hope, and resilience. After Marshall University’s ‘Thundering Herd’ boarded their plane to head home after a victory in North Carolina, the plane crashed due to extreme weather conditions… which resulted in the death of 75 members of the football players and athletic staff. Fighting the odds, Lengyel brought together a team of rookies and second-string players and not only helped restore the team, but also helped the community heal from the tragic accident. Ray Hopper delivers a powerful and motivational speech in the short film The Coach. This film is a true hidden gem, with a story that will genuinely warm your heart. In a motivational half-time speech, he delivers an emotional message to his players about giving your all and achieving more than you thought you were capable of, despite whatever life may throw at you. The Coach’s speech inspires players to rise above the hard times presented, and not only play for themselves – but for their fellow teammates as well. Kurt Russell takes on the role of Herb Brooks, a college coach who was hired to helm the 1980 U.S Men’s Olympic Hockey Team. After bringing together a team of hot-headed, brash college all-stars, their differences and egos result in a humiliating first loss. After that match, Brooks was able to eventually unite his team against the favored Soviet Team. Based on a true story, the story of Herb Brooks and the 1980 Olympics Team is surely one for the books. A Philadelphia native, Rocky will always be a prime source of motivation for me. Sylvester Stallone has made a mark on cinematic history with the character alone, but this speech from the 2006 Rocky Balboa truly stuck with me through the years. Stallone emphasizes that it is not about how hard you get hit, it is about how hard you get hit and despite that – you keep moving forward; because that is how winning is done. Years later, this speech is still being talked about – and is even frequently played during Philadelphia Eagles games. Al Pacino stars as Coach Tony D’Amato, head coach of the Miami Sharks. After suffering consecutive losses and facing a decline in attendance, faith and spirit – Coach D’Amato brings his team together to deliver a live-changing speech. He emphasizes on the importance that nothing in life is handed to you, and that you have to fight to conquer your dreams – inch by inch. This he states is not only true as individuals, but as a collective also. If you don’t like the person you see looking back at you in the mirror every single day, you have to be willing to put in the time and effort to change and become the person you want to be. Gary Cole tugs at your heartstrings in his role as Coach Larry Gelwix in Forever Strong, a movie about the Highland Rugby football team. Although this piece is only a small part of the speech he delivers to his players, it is one that sticks with me. Everyone loves to win, it’s in the human nature. However, when a coach prioritizes turning his players into ‘champions’ individually, that is what truly matters. This film in and of itself is an amazing, inspirational story about finding what truly matters – and coming together. To this day, it is one of my all time favorite movies. What are some of your favorite motivational speeches in Sports Movies?